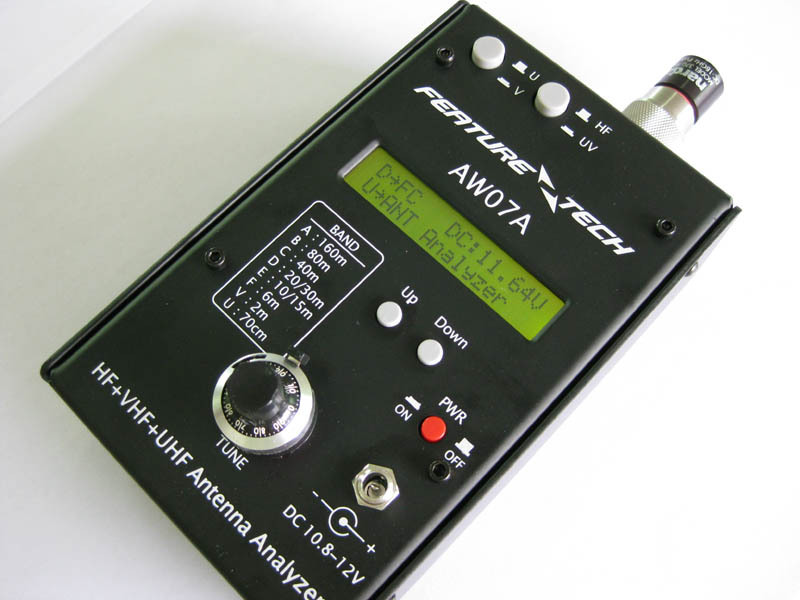 I’ve been meaning to write a follow up to my earlier post about the Feature Tech antenna analyser. The short summary of that post was that when I hooked up the antenna analyser to a mobile whip on a magnetic base, I saw all sorts of SWR values which were often not repeatable and changed even as I was taking my hand away from the meter. I was disappointed with the device. Fast forward a few weeks, in a QSO with Martin VK6ZMS and he was strongly of the opinion that I was doing myself a disservice by running a mag mount without grounding the antenna to my vehicle close to the base of the antenna. Another clue was one idle afternoon at home, I threw the analyser on my WARG Pogo Stick 2m antenna and it had none of the problems I had seen. The SWR readings were reliable (you could read of a value for a frequency, change the frequency then change it back and get the same SWR value) and did not alter as I handled the coax or moved away from the meter. One of the features of this antenna is that it has an coax choke at the base. These two events made me suspect that the problems I’d seen with the analyser may in fact have been related to poor antenna installation letting RF back down the coax, which then interacted capacitively with the surroundings including me. I’m working away from my normal home at the moment, and will be moving out in a week or so. 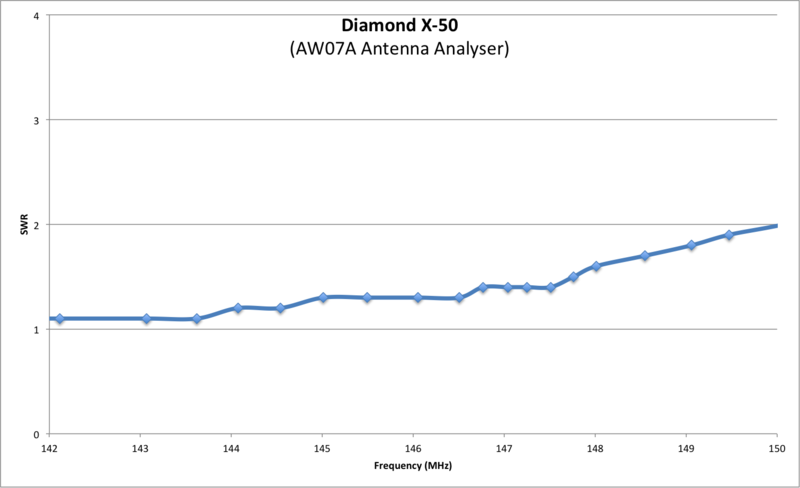 I thought I might take down my new Diamond X-50 this weekend as part of the packing up I’ve started on. Since it’s reasonably well installed up away from the roof and in the clear, I thought I might run the antenna analyser across it and make some charts. 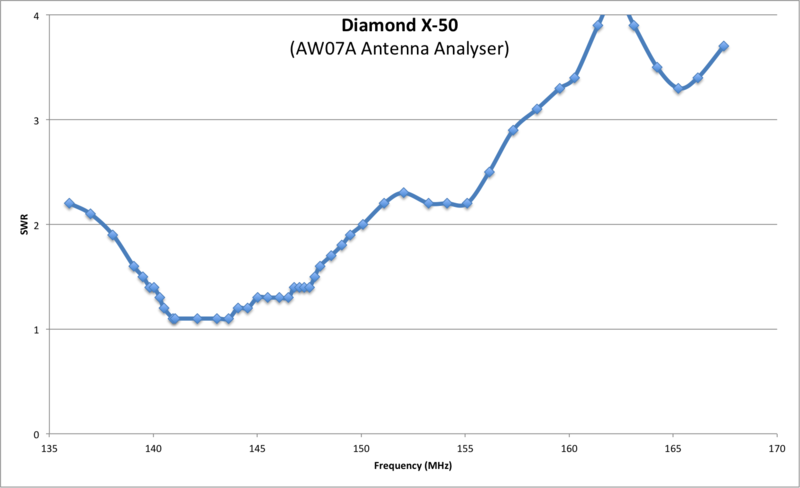 We import, sell and recommend JA-version multiband Diamond vertical antennas. Those models covering the 2m and 70cm bands (or more) are centred on 145MHz and 435MHz and will cover 144-148MHz and 430-440MHz. The swr at 148MHz is 1.8:1 to 2:1 and we know of no problems ever encountered due to this swr present at the top of 2m. This version has been conclusively proven over the past 35+ years to be best suited to the Australian and New Zealand 2m/70cm band plans. Alternatively, we can import “A” suffix (USA) version multiband verticals. However, they would be at higher pricing and their delivery timing would require confirmation. They are centred on 146Mhz and 443MHz (i.e. 8MHz higher on 70cm), covering 144-148MHz and 437-450MHz. 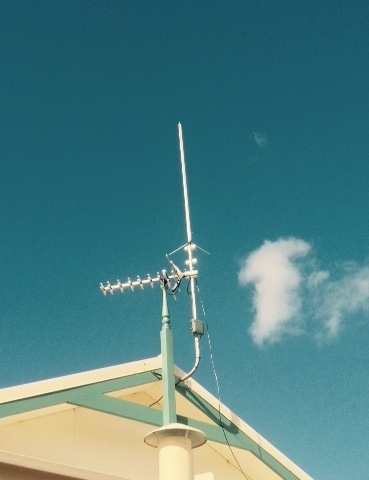 Diamond V/U multiband base station verticals tuned specifically for Australia/NZ band plans simply do not exist! I guess the most common use for these sorts of antennas is going to be FM repeaters and simplex, so looking at the new WIA bandplan, the 2m FM is from 144.7 MHz to 148.0 MHz (centred on 146.35 MHz) and 70cm 431.0 MHz to 440.0 MHz (centred on 435.5 MHz). 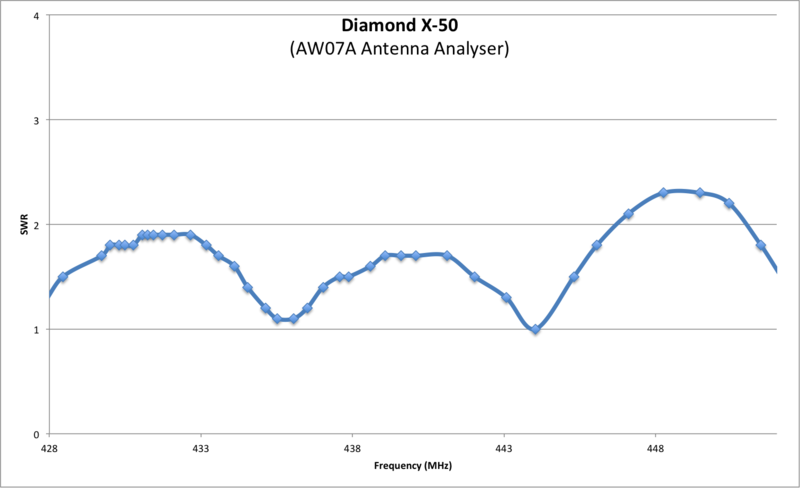 The X-50 is the second smallest of the range, so I imagined that it was not as bigger deal in the lower gain antennas (4.5dB and 7.2dB) and took Andrews’ advice. 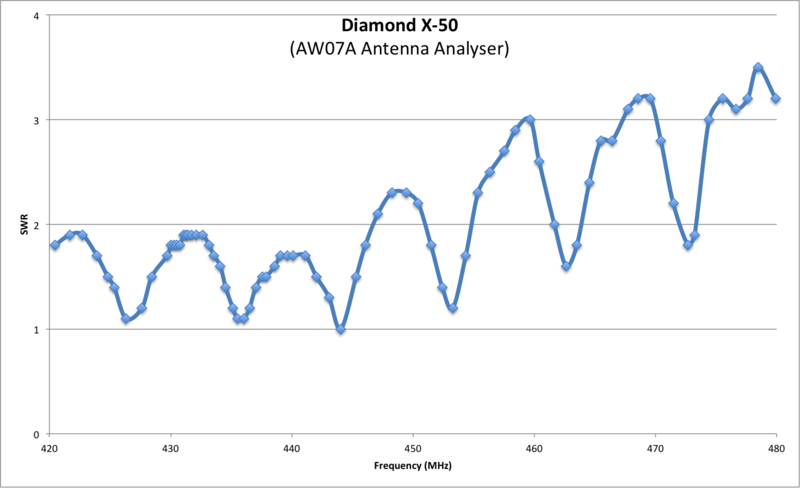 If the analyser can be trusted, the X-50 in the current mounting situation looks fine in the critical frequencies. In a perfect world it would be mounted on a longer pole to get it further away from the roof and TV antenna, and it would have a more direct run of lower loss coax, but even so I’m happy with how it measures up. While I was collecting data, I had a look outside the amateur spectrum, just because I like measuring things. I must say I don’t really understand the reason for the cyclical nature of the SWR as the frequency changes. It would make sense at the various multiples and integer fractions of the resonant frequency, but there seems to be a lot more of them than that. 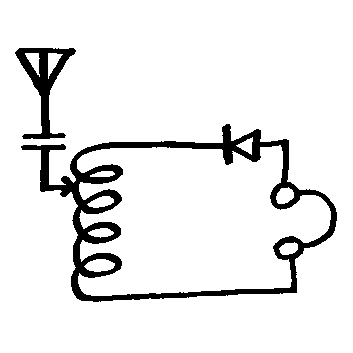 A job for another day might be to repeat this exercise on a simpler antenna and look at the lumps to see if I can workout what the cause of each one is. Posted on September 19, 2015 by I Bailey. This entry was tagged antennas, aw07a, measurement, SWR, WIA, X-50. Bookmark the permalink.